Born in Montreal, Canada, Caiserman-Roth began her art career at an exceptionally early age. When only 12 years old she exhibited at the Montreal Museum of Fine Arts. Later, she continued her foray into the art world through study at the Parsons School of Design, the New York Art School and the Art Students’ League. 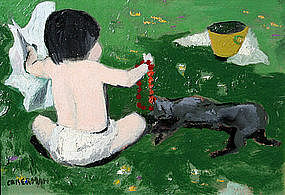 Her work was well-received for its emphasis on social realism, and she won the O’Keefe Art Award in 1951 as well as the Canada Council Senior Fellowship in 1962. Caiserman-Roth remained an active and vital member of the Canadian arts scene throughout her life. She taught and lectured extensively, and in 2000 received the Canadian Governor General Award for the Arts. She passed away in 2005. Colin S. MacDonlad. A Dictionary of Canadian Artists.